ZuraLac™ teat treatments are specially formulated from ZUREX Pharma, Inc.'s proprietary antimicrobial platform, designed to prevent healthcare acquired infections in hospitals and clinic settings. ZUREX Pharma's healthcare technology has demonstrated significant efficacy and safety in well controlled clinical trials. Introducing the ZuraLac family of sanitizing and moisturizing teat treatments that provide a wide spectrum of germicidal effectiveness in a safe and gentle non-iodine formula with a totally novel visual identification of teat dip activity. A dairy facility provides the perfect environment for a wide variety of mastitis causing bacteria to exist and prosper. The ability of a dairy producer to protect their herd against a wide spectrum of organisms is critical to their financial success. 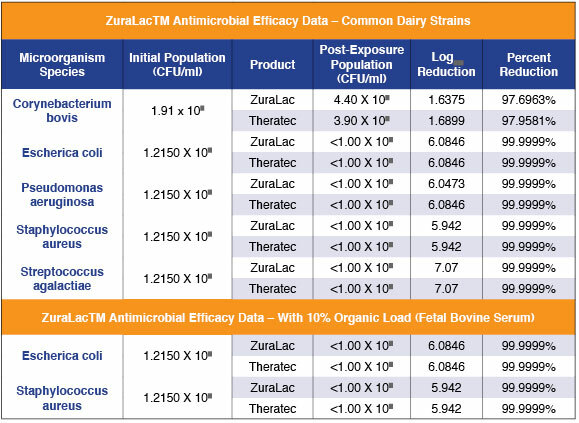 ZuraLac formulas have been tested under well-designed protocols that demonstrate significant safety and efficacy against both environmental and contagious mastitis-causing organisms. Designed originally for human injection and topical pre-surgical skin preparation, and unlike many agents that are harmful to skin tissue, the ZUREX antimicrobial technology has been proven to be safe and gentle to teat skin tissue, yet extremely effective against mastitis causing organisms. A cow's skin tissue is the animal's first line of defense. Studies have shown that organisms causing environmental mastitis, such as coliforms, are more prevalent in sawdust and sand bedding. Cracked skin, cuts and abrasions from environmental damage will easily harbor these organisms on the teat as soon as the cow lies down on dirty bedding. 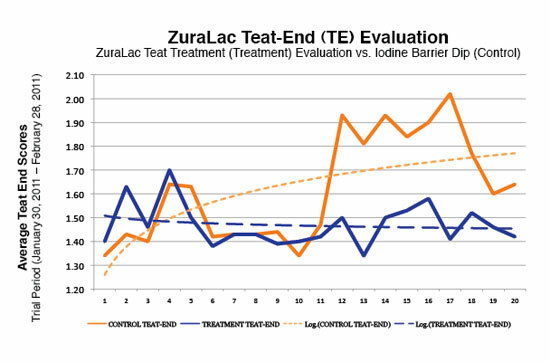 The ZuraLac teat treatments showed consistent teat end scores throughout the study, even under extremely cold weather conditions, obtaining significantly superior results in comparison with a commercially available iodine barrier teat dip. Teat ends dipped with ZuraLac showed consistent, "very good" health and integrity across the trial period, while the control teats showed decreased integrity associated with cold, changing temperatures. These effects carried over into weeks of higher temperatures. What if your teat treatment could indicate the presence of mastitis causing organisms on your cow's teats and udder? What if you were able to tell that your teat dip was continuing to provide protection, hours after your cows left the milking parlor? Now, based upon the patented ZUREX technology, the ZuraLac family of teat treatments provide an indicator to tell you when your cow's udder or teats are overwhelmed with mastitis-causing organisms, and when ZuraLac is present and continuing to protect your "investments". Imagine a teat treatment that tells you that it is still working, and provides an indicator that lets you know the presence of bacteria!